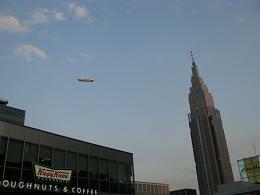 I just looked up at the sky in Shinjyuku. There was a flying balloon floating in the air. It moved so smoothly. The balloon seemed very free and easy. You balloon might feel comfy, don’t you? 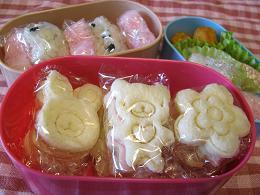 I had an excursion with Youka and made so-called “Chara-ben.”(*1)What I made this time was bear, rabbit and flower-shaped sandwiches and heart and star-shaped rice balls. I was surprised that you can find so many tools to make it at shops. 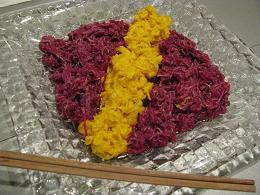 It seems childish; however, once you start creating it, it’s fun. Above all Youka’s happy face makes me happy. ←I appreciate your vote! I assume that Chara-ben is one of the modern cultural fashions in Japan. (*1)Chara-ben : Create characters such as Totoro, Anpanman, kitty-chan and others with lunch ingredients such as rice, bread and so on. 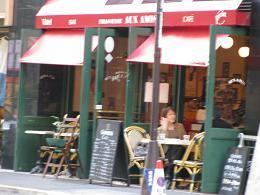 I had lunch at Aux Amis. I was supposed to have lunch with three other friends from twelve, but everybody was fashionably late. The restaurant is one of the most popular places in Marunouchi area. So there was a long line till 12:30. Immediately after the time, we could have a seat. I enjoyed the great lunch with girl talk. Aux Amis is a café close to Kokusai Forum. The atmosphere is like a café in Paris. It suddenly appeared among trees. 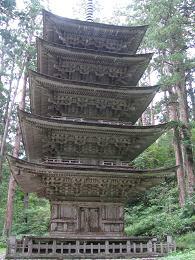 Standing still and stretching toward the sky, the five-story pagoda, one of the national treasures, reflects a mysterious atmosphere in the Haguro mountains in Yamagata. It is said that there were long-nosed goblins in the ancient time. There is a very comfy room in Shirokane, Sinagawa. Natsuko Kasai-san, a nutritionist, usually holds a cooking salon over there. Today, it turned into a house café. She cooked sauced Olive from Shodo island, pickled chrysanthemum petals from Nasu and so on. One of my favorites was simmered meat and potato with rosemary. Adding a bit of herb, one of the typical Japanese dishes changed into a specialty. The leaves were still green just a week ago. Now, those leaves have fallen to the ground and make a dry and crispy noise.It's a really good sound. 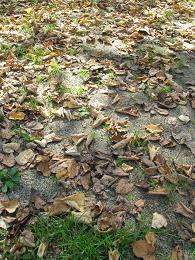 The smell has changed into Autumn; that has a mixed smell of soil and dead leaves. I cooked roast beef today. To keep the inside red and tender, I put pepper and thick salt on the outside. Rotating the meat in the oven, roast it for 40 minutes at 200℃. 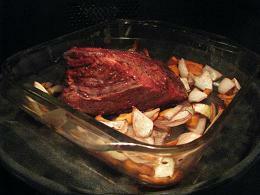 After 15 minutes of roasting, pour red wine over and put carrot and onion in the casserole and roast it again. It’s so easy. Using the gravy, I made a sauce. I enjoyed the spicy savor. ←I appreciate your vote! I bought the chunk of meat for 500 yen! It’s a good deal for this taste! 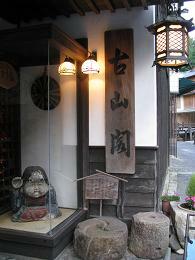 千と千尋の神隠しのお宿〜古山閣 Onsen inn of Spirited Away. 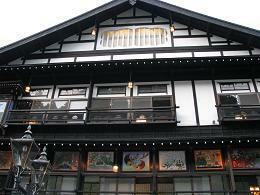 Onsen inn of Spirited Away. The uniform of the clerks seems as if it’s just out of the film. There is something mysterious. The doll sitting right in front of the entrance seems like it is ready to almost start moving. You might feel like your spirit will be taken away somewhere.